Courtesy of the Fine Arts Program, Public Buildings Service, U.S. General Services Administration. Commissioned through the New Deal art projects. Charles Heaney was one of Oregon’s most-admired artists of the twentieth century. As a painter and printmaker, he devoted himself to portraying the regions of Oregon from the cityscapes of North Portland to the vast deserts and mountains in the east. Heaney was born in Octonto Falls, Wisconsin, and moved to Portland, Oregon, with his mother and sister at the age of 15, after his father’s death. Instead of continuing high school in Oregon, he went to work at various factories, eventually settling on an apprenticeship at Brandenburg Engraving Company. There, Heaney learned to engrave jewelry and flatware—skills that would contribute to his printmaking and would provide a means of support throughout his life. The company’s owner recognized Heaney’s talents and encouraged him to study at the Portland Art Museum School (now the Pacific Northwest College of Art). Heaney befriended influential Northwest artists, such as Henry Frederick Wentz and Kyuzo Furuya, and particularly admired C.S. Price (see the poster of Price’s Winter ). Like Price, Heaney found work during the Great Depression as an easel painter for the Oregon Federal Art Project of the Works Progress Administration (WPA). The Federal Art Project was one of many New Deal programs enacted by President Franklin Delano Roosevelt’s administration and designed to create jobs. Heaney later observed, “When the WPA art program came along, it gave me a freedom I had never known before. They bought all the materials and simply told us to paint, or etch or carve—whatever we did. When your stomach starts to get full and you get paid for doing what you love, you can shed a lot of the severe disciplines of the work world and express it as you see and feel it.” Between 1937 and 1939, Heaney completed 64 paintings, including Mountains (1938), reproduced here, as well as The Mountain (1937), painted for Timberline Lodge and on view there. Though he lived in Portland, Heaney captured different parts of Oregon and its diverse regions. As he traveled throughout the state, he chose not to create his paintings on site. Instead he would take notes, sketch, and photograph a scene, then return to his studio and paint from memory, aided by these records. He favored the landscape of Eastern Oregon and particularly focused on the rich, warm desert palette. Heaney’s Mountains occupies most of the canvas, accentuating geological formations and bold contrasts of light. Houses and trees in the foreground further exaggerate the difference in scale to the mountains. His fascination with geology and its layered evidence of history can be seen here as well as his sense of awe of the natural environment in relation to our smaller, human scale. Heaney was an active artist whose career spanned nearly 60 years. How many geometric shapes can you find in Heaney’s Mountains? Choose four or five shapes that you feel are the most important. Create a simplified sketch of Heaney’s painting that emphasizes these fundamental geometric shapes. Cut out the shapes and re-assemble them into a mountain (or mountains) of your own. How is it like or unlike Heaney’s painting? Why did you put the shapes together the way you did? Look closely at the foreground of the painting. Why do you think Heaney chose to include the tiny houses and trees in this image? What relationship do they have—visually or conceptually—to the mountains? What is Heaney telling us about nature? Art historian Roger Hull argues that, while Heaney was inspired by the world around him, “his depictions were not straightforward documentations… Rather, his images evoke a sense of place that goes beyond the physical reality, filtered through memory, imagination, and personal vision.” Do you agree with Hull’s assessment? In what ways does the painting Mountains differ from a realist style? How does it suggest emotion, memory, and imagination? Artists often idealize landscapes to create invented worlds for themselves. If you were to reinvent this scene where would you live in it? Would you change the arrangement or sizes of the different elements? How would those changes affect the overall feeling of the work? Artists often ask us to travel through their works, especially when their works portray landscapes. How would you travel through this landscape? Write a brief description of your journey. Include all of the smells, sounds, sights, tastes, and touches of your journey. Compare Heaney’s painting to Wendy Red Star’s Indian Summer (2006), also included in the Poster Project. 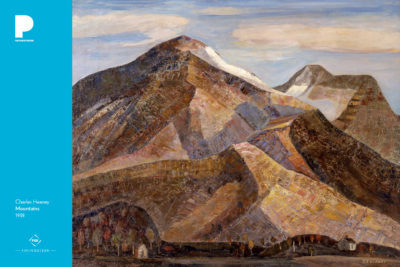 These artists have both chosen to depict Western United States mountain scenes—yet with very different materials and intentions—75 years apart. If these artworks could have a conversation, what do you think they would say to each other? Charles Edward Heaney, The Oregon Encyclopedia. Roger Hull. Charles E. Heaney: Memory, Imagination and Place. Hallie Ford Museum of Art, Willamette University. (Seattle: University of Washington Press, 2005).